U.S. and European Union officials are attending a recurring bilateral meeting on aviation in Oslo today and tomorrow — but this time it will be amid efforts by three major U.S. airlines to gut Europe’s pioneering anti-pollution program for aviation. Meanwhile, the airlines’ move has garnered public chiding from a group of major environmental groups. 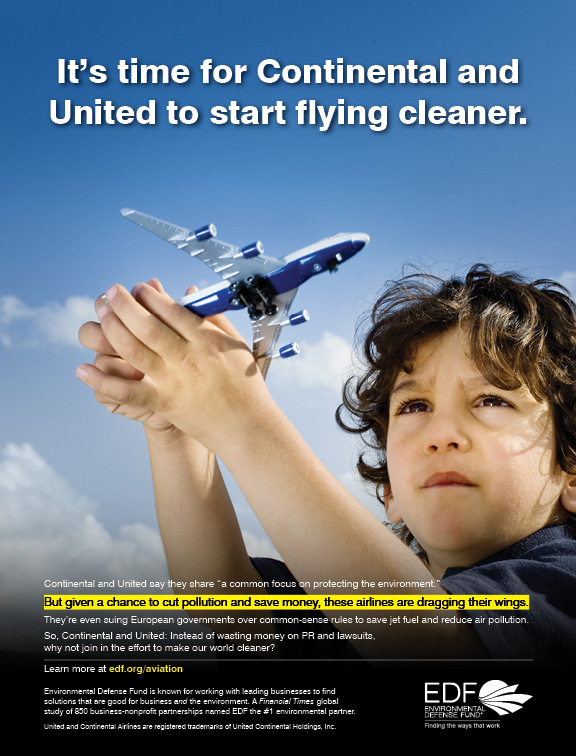 This advertisement calling for Continental and United to "start flying cleaner" ran on page 2 today in POLITICO, in advance of a U.S.-EU bilateral meeting on aviation. United reaffirms its commitment to the environment, both in the air and on the ground… [and that the company is] Committed to leading commercial aviation as an environmentally responsible company by taking actions today that shape a sustainable future. 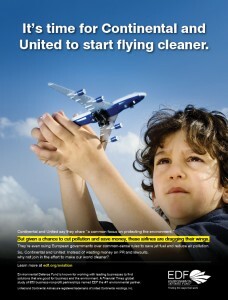 The ad that ran in POLITICO is the same one EDF also submitted to both airline in-flight magazines on May 11th. Last month EDF had requested the airlines respond in a week to whether the ads could run in the magazines, but it took only a matter of hours for EDF to receive a phone call from a United representative stating the United and Continental ad would not be accepted into Hemispheres magazine. Our policy is not to run advertisements which can be perceived as targeting or highlighting social and/or political issues. Additionally the ad itself is demeaning to the American airlines brand. The amount of global carbon emissions from aviation is expected to grow 3-4 percent per year, according to the Intergovernmental Panel on Climate Change.